Since I previously wrote a post on how to tweak Windows Vista, I thought I would throw in some power toys for the Windows XP users. Windows XP is not going to disappear any time soon, so if you still have not gotten around to customizing it the way you want, take a minute and read through this article. One of the best programs for tweaking Windows XP is the TweakUI PowerToy utility from Microsoft. Using this nifty little program, you can fine-tune many Windows settings quickly and easily. You can tweak many settings, from how to group items in the taskbar to disabling or getting rid of those annoying shortcut icon arrows on the desktop. This if very useful if you’re like me and always have about 20 windows open in your taskbar. Even with the taskbar grouping, it can become a pain to find the program you’re looking for. Using this, you can increase the number of programs that show up when your press Alt + Tab. 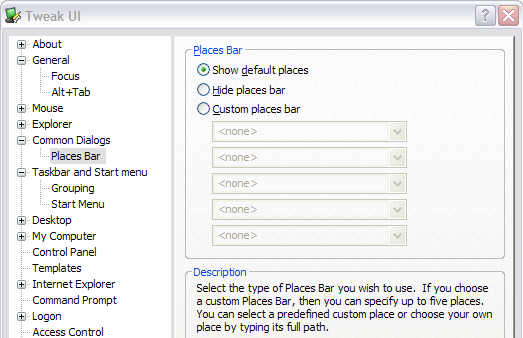 The Places Bar is what shows up on the left side of the Open and Save file dialogs from Word, Excel, etc. The usual options are Desktop, My Documents, My Computer and My Network Places, but you can add your own custom locations using this option. You can hide Control Panel items so that they do not show up when you go to the Control Panel dialog. However, this does not uninstall it or prevent someone from opening it via the command prompt. Only useful if you want to hide it from users who don’t know what they are doing. This will allow you to log into Windows automatically, even if your computer is on a domain. Also, the password is stored in encrypted format. You can also control access to many of the Administrative tasks using TweakUI. 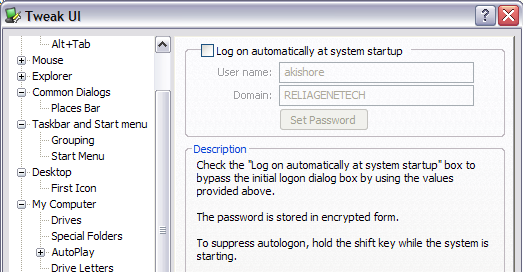 For example, you can control who can manage file and printer sharing, manage disks, manage shares, etc. Finally, you can use TweakUI to repair Windows in case something has become corrupted. You can rebuild icons, repair the font, My Music, My Pictures, My videos folders, and more. Overall, a very handy utility that Microsoft provides for free. Should be something built into the Control Panel, but for now you’ll have to download it!